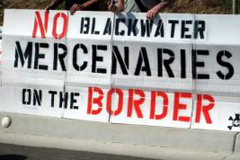 Sign from a military families organization opposed to Blackwater. October 1, 2008 (Otay Mesa) – In September 2007, 17 people were shot to death in the Nisour Square traffic circle in Baghdad, Iraq, by Blackwater Worldwide security guards contracted by the U.S. State Department. Two dozen more civilians were seriously injured, including a lawyer shot in the back four times as he tried to run away. Marking the anniversary, about 150 protestors demonstrated outside Blackwater West’s new Otay Mesa Naval Training Facility on Sunday, September 14, raising concerns about the private military contractor’s presence in San Diego and along an international border already rife with tension. No one has been prosecuted for the Iraqi civilian deaths. Investigations by the Iraqi government and the U.S. military, as well as initial assessments by the FBI revealed that the attack was unprovoked, as reported in the Washington Post. Blackwater claims their guards fired in self-defense. Pelton added, referring to the aggressive tactics, that “the Blackwater security guards were doing exactly what the State Department wanted” to protect its diplomats. There was a notable absence of major media covering the local protest. Demonstrations at four other Blackwater facilities across the country also took place over the weekend. In the Nisour Square incident, four Blackwater vehicles were stopped at a barrier erected to protect construction workers. Apparently, the guards fired weapons to stop other cars from entering the traffic-jammed circle. A witness, a traffic guard, recounted how Blackwater operatives shot a man driving into the traffic circle while commuters scattered, confused and panicked. His mother, a doctor, cried for help and dove to the driver’s seat to hold him. The car, an automatic, continued rolling, so the guards shot and killed the mother and continued shooting the car with machine guns until the car exploded. The son was also a medical student. A nine-year-old boy was shot in the head and died in his father’s arms. Blackwater security guards also shot into a city bus during the traffic circle melee. Representative Bob Filner, speaking to the rally via phone from Washington, D.C., said, “The more we learn about Blackwater the more we know that this is the kind of company, this is the kind of activity we don’t want in San Diego.” The Otay facility is in Filner’s district. Legal experts have said that the security guards are probably immune to prosecution because of State Department agreements with Iraq regarding private contractors. Several Iraqi families have filed civil lawsuits charging Blackwater with war crimes, and the Justice Department is still investigating the Nisour Square incident. Paramilitary Group on the Border? families organization opposed to Blackwater. “We should all be concerned,” Rios said. “I know what it is to see border patrol taking after people, detaining them, and beating them up. I know what it is to see checkpoints where people randomly search and ask questions. I know what it is to have our civil liberties called into question,” said Rios. Gregory Morales of the Mexican American Political Association, spoke of racial bias he observed among Border Patrol and Blackwater personnel during last October’s wildfires, reflecting a bias that exists in the larger community. “The Blackwater people and the Border Patrol, who were working together in the same station, said, ‘Why do you want to go there, there’s nothing but drug addicts and criminals.’ A broad generalization of all the people there. Because they look like me?” asked Morales. Blackwater is owned by Eric Prince, who heads a consortium of corporations under the Prince Group. They manufacture armored personnel carriers, helicopters, unmanned remote piloted airships, the BW-15 (Blackwater assault rifle); and are also involved in military training, security, property management, and the list goes on, said Wiley. Wiley noted that the Prince group has materials manufacturing and mechanical equipment manufacturing in both Juarez and Monterrey, Mexico. “And then we have this facility less than a mile from the Otay-Mesa border crossing. What’s the relationship?” He also asserted that Blackwater was actively bidding for contracts in the war on drugs in South America. Blackwater facility in Otay Mesa. Bonfiglio said Blackwater is in San Diego because it’s close to home for the Navy. Any contract bidding for activities in South America is “an untruth,” he stated. “We kicked you out of Portrero. 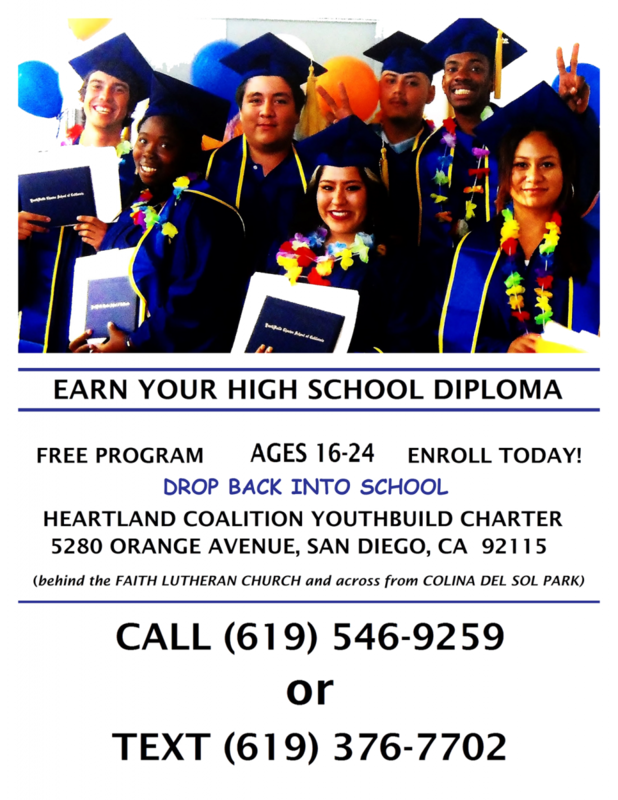 We will kick you out of San Diego. And we will get you the hell out of Iraq,” said poet protestor Jim Moreno. Amidst intensive civic protest Blackwater pulled its plans to develop military training facilities in Potrero, a rural East County community that straddles Filner’s 51st congressional district and retiring Representative Duncan Hunter’s 52nd district. Bonfiglio said that Blackwater abandoned plans for the Potrero facility when they found they could not meet the county’s noise ordinance of 50 decibels at the property line. The project was pulled March 7, 2008. Lutz said that to move into the Otay Mesa facility, Blackwater used pseudonyms such as ‘Southwest Law Enforcement’ to “slip under the radar,” employing phrases such as ‘vocational training center’ in lieu of ‘warfare training center.’ “Can we trust them to tell us the truth?” Lutz asked his audience. Blackwater’s contractor, Raven Development, under the parent company B&J Holdings, filed for permits to lease the warehouse on Siempre Viva Road in Otay Mesa. The City of San Diego’s Development Services Department informed Blackwater that further permit processing and environmental compliance was necessary, prompting Blackwater to sue the City for civil rights violations. Blackwater won its case in federal court. investigation into the permits issued to Blackwater. • Did Blackwater represent its identity or intended use of the Otay facility? • Did City staff properly issue permits in compliance with codes and regulations for the facility? • Is the designation of ‘vocational/trade school’ appropriate for the site? Bonfiglio pointed out that the City determined that Blackwater never tried to hide its business, business name, or its intent for the facility. But the report highlighted a few confusions. The City of San Diego does not require business owners’ names on building permit applications. If the City called his general contractors, Bonfiglio said, to clarify permit codes, that would explain a clarification for “modular” as opposed to a “permanent” facility. “We’re part-time help,” said Bonfiglio. “When the Navy’s finished with us, they will say ‘thank you very much,’ shake our hand, and we go away.” He added that Blackwater has been servicing a U.S. Navy contract in San Diego for over five years. Bonfiglio asserted that Raven Development is a well-known Blackwater affiliation, the same company that was on all their permits while they applied for the Potrero project. The Justice Department has sent target letters to six of the Blackwater Worldwide security guards, which could lead to indictments for the Nisour Square shootings, although State Department immunity agreements will probably prevail. “In the words of one US official, Blackwater has a client that will go to the ends of the earth to protect it, to shield it, because the US needs, the Bush administration needs, Blackwater,” said Jeremy Scahill, author of Blackwater: The Rise of the World’s Most Powerful Mercenary Army in an interview on Democracy Now! Towards the end of the protest rally, Taha Hassane, Imam/Director of the Islamic Center of San Diego read the names of the people killed in Nisour Square one year ago, as well as the number of children each of the deceased left behind. In a period of silence, Carol Jahnkow rang a bell seventeen times. Gayle Early is a freelance writer who lives in La Mesa, California. She was a former senior technical and grant-writer with UCSD and editor for Academic Press/Harcourt Brace. You can find her blog at www.redroom.com/member/gayleearly. In reviewing the the websites that david wiley sent i was confused because it seemed as though it all backed bonfiglio's comments. i then read again what bonfiglio stated in this article and in fact all the information showed that bonfiglio did refute wileys comments based on truthful accounts. meaning that ICE is not border patrol and border patrol is not ICE. Thats like saying that san diego police are the same as san diego sheriffs. Both would dispute that. However, what i did learn is that both ICE and border patrol fall under homeland security. I will also say that many groups have put it out that bonfiglio has stated over and over again that he and black water would support all federal, state, county and city law enforcement firearms training. In looking at the websites i learned that this tiny 13 thousand dollar contract was for firearms related training. i also learned that it was a 'full and open competitive bid'. So they won this ICE contract fairly??!! I thought they only were awarded no-bid contracts? outside of this nebulous point i think we should focus on pedro rios' comment about the border patrol beating people. No - i dont believe it, but i would like him and the paper to support this claim or disregard based on a plain ole' lie. i hope the paper looks into it. In this article I was quoted as saying that Blackwater specifically engaged in training with the border patrol in San Diego. My statement was refuted by Brian Bonfiglio, Vice President of Blackwater West. A contract for California 53rd congressional district, was in fact with the Bureau of Immigration and Customs Enforcement. The effective date of the contract was 08/07/2007, the completion date of the contract was 09/15/2007. The description of the contract was shown as: "Required for effective firearms training at the range"
This contract, it is true, was performed before the current facility was in operation, but Blackwater was providing training at that time in San Diego for the Navy, and apparently, from the above data, for ICE, at another firing range in San Diego. I did not say that Blackwater had current contracts with the Border Patrol, but that Blackwater "has engaged in" training for the Border Patrol in San Diego. If the training was in fact with a division of Immigration and Customs Enforcement other than the Border Patrol, I invite Mr. Bonfiglio to disclose that information. The federal contract database is public information, and it belies Mr. Bonfigilio's statement that "there never has been" Border Patrol contracts, unless he is parsing words and the training was with another division of ICE.